The Trenchless Technology Center (TTC) will hold its second Auger Boring School (ABS) on Feb. 13-17, 2017, at Louisiana Tech in Ruston, LA. Auger boring has been around since the 1930s when the first homemade machines were used to mine coal. For years, knowledge and information about the auger bor..
At first glance, it may seem like the only noticeable difference between crawler and wheel excavators is their undercarriage. But if you look more closely, you will notice each machine has its own features and benefits that need to be considered before purchasing. Ground conditions, for example, pl..
A recent project at McGuire Air Force Base in New Jersey is believed to be the largest cured-in-place-pipe (CIPP) liner ever installed. CIPP liners were placed in three segments of 120-inch diameter storm sewer pipes running beneath the air base’s tarmac. “It is our understanding that this is the ..
Amarillo, TX, is known for petroleum, beef and helium. But water could be this Western Panhandle city’s most valuable commodity. It is for Monte Taylor, president of Amarillo Utility Contractors, whose company places more than 2 million feet of water and sewer pipe each year. Amarillo sits in the c..
By Rita Tubb, Executive Editor Underground Construction’s 2016 survey shows 47,693 miles of pipelines are planned or under construction. Of these, 19,115 miles are in the planning and design phase, while 28,578 miles are in various stages of construction. The following reflect pipeline mileage in t.. The newest model (SK140SRLC-5) in the Kobelco SK140SRLC series retains the compact design and short rear swing agility while providing industry-leading value, productivity and durability through enhanced capabilities. It boasts a dynamic digging force of 21,357 pounds to achieve leading-class work v.. The MaxLiner System is small enough to fit into your existing service vehicles and needs just two or three workers to get the job done. The highly portable system allows you to install more than one job per day, and its lightweight design allows you to quickly and easily use it for not only traditio..
Doosan DX225LC-5 excavator with 162-net-horsepower has a reliable design for demanding construction applications. The DX225LC-5 is available in a super-long-reach (SLR) configuration designed for increased reach and dig depth. The SLR model has more than 20 feet of digging reach than the standard co..
Carylon Corporation, a North American comprehensive environmental maintenance service provider, has purchased several state-of-the-art pipeline asset management and investigative technologies from JD7 that allow Carylon to inspect and conduct condition assessments in live pressure water mains across..
John Deere is building on its lineup of SmartGrade crawler dozers with the integration of the machine control offering on the 750K and 850K models. “The launch of our 700K SmartGrade dozer was a huge hit earlier this year, and many of our customers asked for the grade control technology to be integ..
TT Technologies recently introduced a new cutterhead configuration for its Grundoburst static pipe bursting system consisting of three specially designed bladed, roller cutterheads in succession. This allows contractors to burst/split large-diameter steel and ductile iron pipes when used with larger..
StraightLine HDD Inc. has announced the finalization of an exclusive agreement with Armadrillco Inc. for distribution and manufacturing of Armadrillco downhole products. The agreement takes effect immediately. 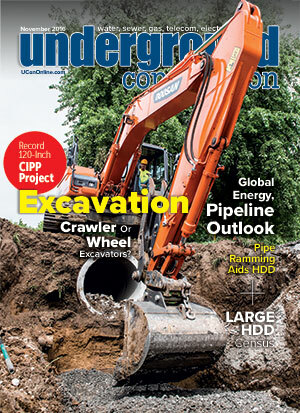 “Armadrillco’s HDD tools are highly complementary to our tooling portfolio,” said Straigh.. I would like to introduce you to Seattle Public Utilities (SPU) Sewer Lining Program. Over the past several years our annual Sewer Lining budget has grown from $1 million to approximately $4 million in 2016 for CIPP contracts. CIPP continues to be SPU’s method of choice to rehabilitate our ageing pi..
Radius HDD, a Charles Machine Works company, has completed its new facility dedicated solely to the design, manufacturing and distribution of HDD tools. The new facility will allow Radius to continue supporting drillers coast to coast, as well as the space to continue developing new and innovative t..
By Robert Carpenter Editor-in-Chief Another line in the sand has been drawn for the energy pipeline industry. The unfortunate ripple effects from the Keystone Pipeline fiasco continue to resonate throughout the energy and environmental political block. Initially, Native Americans from a small Stan..